The World No. 69 from France wins his second ATP title, lifting his first trophy since 2015. 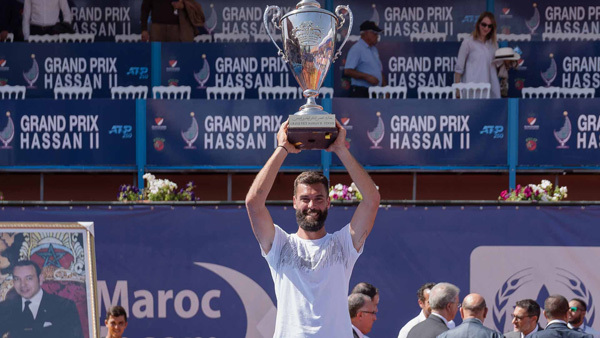 Benoit Paire is the new champion of the Grand Prix Hassan II, the lone ATP Tour event held on African soil. The 29-year-old Frenchman defeated last year’s Marrakech winner Pablo Andújar from Spain 6-2, 6-3 in Sunday’s singles final. Paire sent down eight aces, saved the only break point he faced and capitalized on three of his four own chances to secure victory in one hour and five minutes. By lifting his second ATP Tour trophy, his first title since 2015, Paire collects $87,745 in prize money as well as 250 ATP-Ranking points. He improves to 12-5 in Morocco. Paire beat Aljaz Bedene of Slovenia, Spaniard Jaume Munar as well his compatriots Pierre-Hugues Herbert and Jo-Wilfried Tsonga en route to the final. This entry was posted in ATP 250 Marrakech, ATP Tour and tagged ATP Tour, Benoit Paire, Grand Prix Hassan II, Marrakech.